It's a situation we are all acquainted with: planning to visit friends in an unfamiliar part of the city, you draw yourself a rudimentary map with detailed directions. In March 2008, graphic designer Kris Harzinski founded the Hand Drawn Map Association in order to collect just such drawings of the everyday. Fascinated by these accidental records of a moment in time, he soon amassed a wide variety of maps, ranging from simple directions to fictional maps, to maps of unusual places, including examples drawn by well-known historical figures such as Abraham Lincoln, Ernest Shackleton, and Alexander Calder. From Here to There celebrates these ephemeral documents - usually forgotten or tossed aside after having served their purpose - giving them their due as artifacts representing stories from people's lives around the world. From Here to There celebrates these ephemeral documents - usually forgotten or tossed aside after having served their purpose - giving them their due as artifacts representing stories from people's lives around the world. There is the young woman suffering from juvenile rheumatoid arthritis who created maps of the Humira injections on her stomach and thighs to help her remember the sites, and give them time to heal. Or the young boy who imagined a whole country for ants and put it to paper. Lucas from Australia drew an obsessively detailed map of his local traffic island, and a teenage girl contributed a map of her high school locker. Two American tourists got lost in the Bulgarian mountains following the hand drawn map of a local, and Britanny from Denmark drew directions to an animal rights protest in Copenhagen. 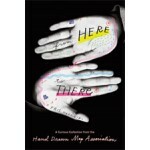 The maps featured in From Here to There are as varied and touching as the stories they tell.